with a good friend and a 6 pack. Clearly the critics agree: “5 STARS - the funniest man on earth” - Winnipeg Free Press; “4 STARS - the crowd howled” - Victoria Times Colonist; “still the funniest man in Canada” - Toronto Sun; “Edwards reigns as the King of Canadian comedy” - Charlottetown Guardian; “Derek Edwards is hysterical” - Calgary Sun; “Edwards takes stand-up to next stage” - Georgia Straight; “the epitome of timing & storytelling” - Halifax Chronicle Herald; “the comedian’s comedian” - London Free Press. 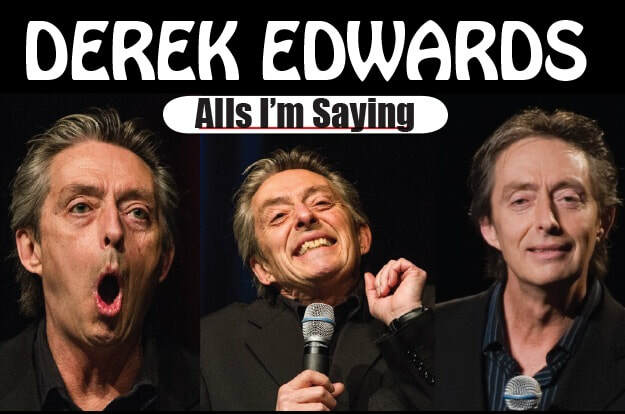 Alls I’m Saying - Derek Edwards’ new 90-minute stand-up comedy show, ...a richly textured and enthralling 'cut above,’ delivered with pace and authority by the consummate Canadian Comedian. or AFTERNOON OF YOUR SHOW. The doors to the theatre will open approximately 30 minutes before the show.